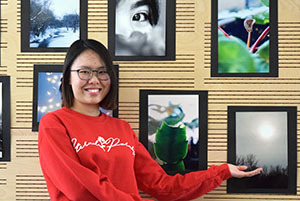 Khoo Sze Xin, senior communication studies major from Malaysia, is currently presenting her photography exhibit in the Liberal Arts building at Fayette Campus. Faculty, staff, students and other visitors to the Upper Iowa University Liberal Arts building at Fayette Campus can currently view a collage of vibrant photographs near the Writing Center. The exhibition is a collection of photographs captured by senior communication studies major Khoo Sze Xin of Malaysia. Although she was eager to begin the project, Khoo did not imagine that it would be much of a success as she had not taken pictures for over a year. 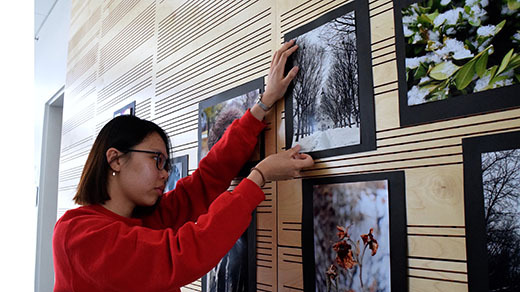 Khoo Sze Xin is pictured hanging up the photographs she captured for her senior special project exhibit. Khoo developed a passion for photography when she noticed the work of professional photographers on Instagram. Every week, special project advisor/associate professor of communication Dr. Melle Starsen would suggest a theme for Khoo to photograph. The subjects included people, trees, props, buildings, indoor flora, the sky, landscapes and selfies. Another theme that Khoo enjoyed was sky photography. She found the topic to be most challenging due to the cloudy, gray skies of winter. “I’m proud to say that my special project has made me more confident about my photography skills as I took better photos as each week passed by,” Khoo concluded.